The Prestige Double Room Doge is located on the Noble Floor of the Palazzetto Pisani in the rooms of Doge Alvise Pisani. 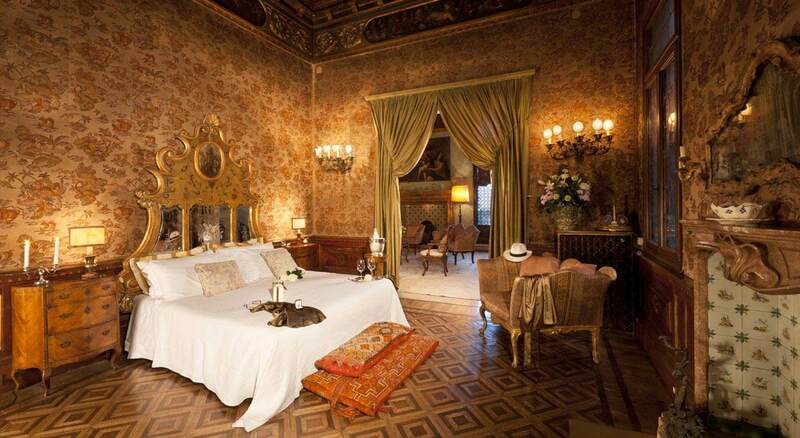 The room with a double bed is done in shades of gold and is a real tribute to the magnificence of the past. History lives on in this room through the decoration of the ceiling and the valuable fabrics lining the walls which tell the story of Serenissima and the Republic of Venice. The headboard is entirely in gold leaf with mirrors that reflect the period fireplace on the other side of the room, which displays beautiful antique vases of Murano glass. The cozy bathroom includes an antique tub and sink. In the Prestige Double Room Doge several scenes of the movie “Casanova” (2005) were shot with the actor Heath Ledger, two-time nominee for the Oscar and winner of the Oscar and the Golden Globe in 2009 as Best Supporting Actor for “The Dark Knight”.